U.S. Army Staff Sgt. Ty Carter, recounting the day in 2009 that led to his receiving the Medal of Honor at the White House last week. For the first time since Vietnam, two living service members have received the Medal of Honor for the same battle. Staff Sgt. Clinton Romesha received his in February. Sgt. Carter is only the fifth living recipient of the Medal of Honor since Vietnam. 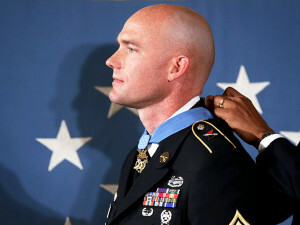 On August 26, President Obama presented the nation’s highest military award to Staff Sgt. Ty Carter.